Disney is known for the many ways they entertain kids of all ages, and now they can add one more! Oral-B and Disney have partnered to create a timer to help kids brush their teeth for a full two minutes every day. One of the ways to help kids achieve this goal is to provide fun dental care tools and incentives. Involve your child in purchasing fun toothbrushes that are easy to for him or her to use, along with toothpastes and floss that are fun and colorful. This will provide your child with motivation to brush their teeth and see it as a fun activity. 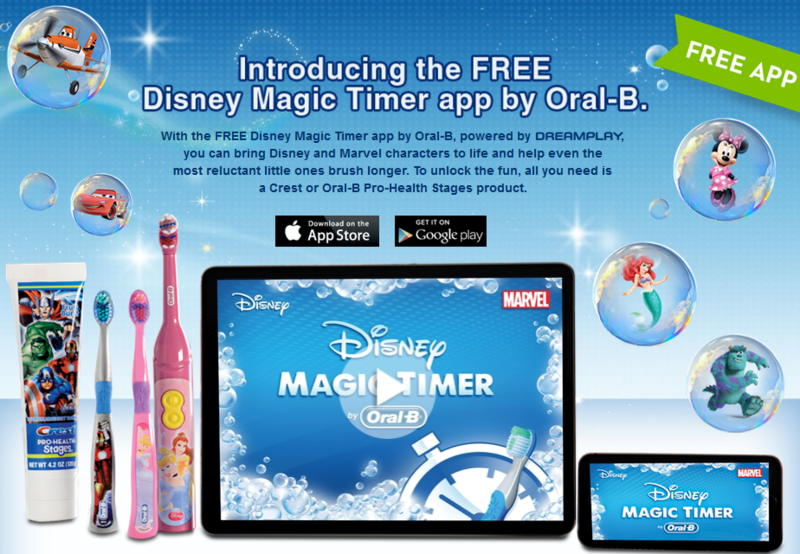 Consider choosing a Crest or Oral-B Pro-Health Stages product to use with the Disney Magic Timer App. Another way to make sure kids brush their teeth for a full two minutes is to brush with them, once in the morning and once before bed. This shows your children that brushing teeth regularly and thoroughly is an important habit for good daily dental care. Set a timer to make sure that you both brush for two minutes, or use one of the videos or apps below. The Ad Council and Partnership for Healthy Mouths/Healthy Lives recently released a series of videos to keep kids brushing. Head over to 2min2x, a website that showcases these videos, along with a variety of different ways to keep kids excited about brushing and flossing their teeth. Using videos that include favorite characters like Elmo from Sesame Street, Tom & Jerry, and The Dream Jam Band, these helpful videos keep kids brushing for good daily dental care. Don’t be afraid to play a favorite video more than once to hit that two-minute mark before brushing is done! Another option uses smartphones and tablets to display a magic timer, created by Disney and Oral-B in order to keep kids brushing. Once the app is downloaded for free through Google Play or iTunes, kids can collect new digital stickers after each successful two minutes of brushing. The app keeps track of your child’s brushing progress with stars and milestone badges on the Brushing Calendar. As kids keep brushing, more Disney and Marvel characters appear, including Mickey and Minnie Mouse, James P. “Sulley” Sullivan, Lightning McQueen, Ariel, Tinker Bell, and more! While downloading the Disney Magic Timer App is free, it’s important to keep in mind that it needs to be used with a Crest or Oral-B Pro-Health Stages product. Use this as an opportunity to get your children involved and excited about brushing their teeth! Dentists in Hillsdale Portland Dr. Howard Jarvis and Dr. Tiffany Goldwyn encourage parents to bring their children in for regularly scheduled dental check ups at Southwest Portland Dental. Call us at 503-244-8112 to schedule your appointment!